What will 2017 bring for OnePlus? If you love a good smartphone rumour, these are heady times: leaks and gossip about upcoming handsets circulate all year round, not least because the major manufacturers have kindly spaced out their launches so we can catch our breath between them all. For now we're going to focus on the next flagship phone from Chinese startup OnePlus, which we're tentatively going to call the OnePlus 4. Can the small firm strike the right balance between specs and affordability again? Here's what we think we know so far. First of all are there any clues to be gleaned from this year's OnePlus phones? The OnePlus 3 really wowed us when it broke cover in the summer, and in fact we called it "the perfect budget flagship". As it had long been threatening to, OnePlus put together a phone that felt genuinely premium in every way except the price. The only slight quibbles we had with it were the lack of a QHD screen (next year maybe?) and so-so battery life. OnePlus wasn't hanging around this year: in November we got treated to the OnePlus 3T, which basically took everything that was good about the OnePlus 3 and improved on it. There was a faster CPU, a bigger battery, more RAM and a better camera - not bad at all for a mid-season upgrade. The arrival of the OnePlus 3T means the OnePlus 4 has got a lot to live up to - and it either means we're in for more of an incremental upgrade next year or that OnePlus has got a real powerhouse lined up. OnePlus hasn't said anything official about the OnePlus 4 yet - not even that it exists - but if the company wants to get out a handset in 2017 then the wheels will already be in motion... and the people responsible for moving those wheels sometimes leak a little more than they should. We've been hearing the OnePlus 4 is going to rock a 5.3-inch screen, slightly smaller than the current models, and will at last make the jump to a 2560 x 1440 pixel QHD screen - apparently it thinks getting into virtual reality is worth the battery sacrifice. The much-vaunted Snapdragon 835 CPU from Qualcomm is tipped to be inside - likely to be the top processor of 2017 - together with 6GB or 8GB of RAM. There's also talk of a whopping 4,000mAh battery (the OnePlus 3T has a 3,400mAh one), which should help to counter the extra power draw of that high-resolution screen. Design-wise we're expecting an evolution rather than a revolution in the look of the OnePlus handset, although there have been whispers that a ceramic model is on the way. Add all of that up and you have one mighty impressive phone. There's plenty more to be had from the OnePlus 4 rumour mill. The camera is of course an important consideration in any smartphone purchase and in this department the word on the OnePlus street is that the Chinese firm will follow Huawei and indeed Apple in introducing a dual-lens camera around the back of the OnePlus 4. That should mean picture upgrades in all kinds of ways, from shutter speed to low light performance, and this is an area OnePlus has previously struggled in (relatively speaking). This year's OnePlus phones already make use of USB Type-C, so there shouldn't be any change there, and the storage levels (64GB and 128GB) will probably be the same too. We think OnePlus might try and follow the general industry trend by making its next handset waterproof, but that's by no means a given. As for the 3.5mm headphone jack, well, OnePlus chief Carl Pei ran a poll on Twitter and customers voted overwhelmingly in favour of keeping it on the OnePlus 4, so without anything else to go on we'll predict that's exactly what's going to happen. There's very little doubt that OnePlus is going to follow up its fantastic 2016 with another handset in 2017, short of a natural disaster or two. The biggest surprise might not be in the design or the specs of the phone but in the name - there are some reports circulating on the web that OnePlus will skip a version number and go straight to the OnePlus 5. It wouldn't be the first manufacturer to do so... and the number four is considered unlucky in China, so superstition might play a part. As for the other rumour snippets we've mentioned here, we'd say they've got a healthy chance of coming true. The OnePlus 3T has set the bar very high, which means the OnePlus 4 is going to have to pull out all the stops to make a big impression - and after 2016 we'd say OnePlus knows what it's doing. 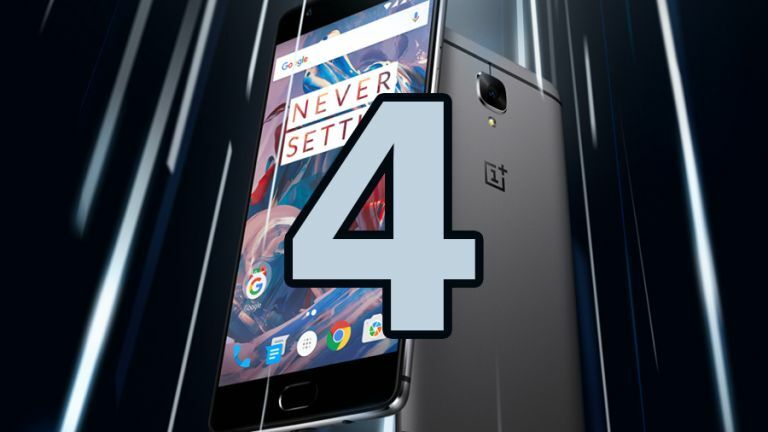 With the OnePlus One launching in April 2014, the OnePlus 2 in July 2015 and the OnePlus 3 in June 2016 we'd say early summer is a very good bet for the arrival of the OnePlus 4.